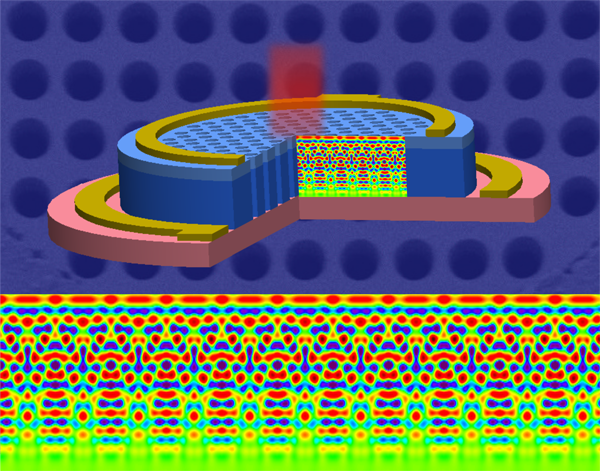 Lateral optical modes excited in a microstructure-hole photodiode by surface illuminated optical signal for enhanced external quantum efficiency with a thin semiconductor layer. Fiber optical receiver, as a vital part of the optical communication system, needs to be cost-effective and power-efficient to satisfy the growing demand of high speed high traffic volume data transfer in data centers. Commercially available optical receivers often contain photodiodes (PDs) based on III-V materials such as InGaAs/InP, which incur additional cost of packaging with electronics since it is incompatible with complementary metal-oxide-semiconductor/bipolar and complementary metal-oxide-semiconductor (CMOS/BiCMOS) process. Germanium/Si PDs, which are compatible with BiCMOS process, can be monolithically integrated with all electronics on a single chip, fully hermetic and without ceramic multichip carriers for the receiver end, which can reduce the cost dramatically. Unlike resonant cavity type Ge/Si PDs, where the detection is sensitive to both wavelength and temperature; or waveguide type Ge/Si PDs, where the fiber alignment to the waveguide cost is high and the optical loss is also undesirable, a surface-illuminated Ge-on-Si PDs with photon-trapping microholes is proposed to achieve both high efficiency and high speed at the same time. This work is carried out in Prof. Saif Islam's group at University of California, Davis, USA，and related results are published in Photonics Research, Vol. 6, Issue 7, 2018 (H. Cansizoglu et al., Surface-illuminated photon-trapping high-speed Ge-on-Si photodiodes with improve efficiency up to 1700 nm). As shown in the figure, the photon-trapping microholes enable predominantly lateral modes in the Ge layer when nominally normal incidence photons are impinged onto the surface. In other words, the light travels in the lateral direction in this structure which enhances the absorption of the photons. This allows the use of thinner Ge layer which can have a high efficiency and high speed for optical interconnect applications. In addition, unlike gratings, photon-trapping is insensitive to angular dependence of incident light and has a relatively smooth spectral response from 1200 to 1700 mm. Dr. Shih-yuan Wang, Silicon Valley executive, believes that this work has significance for monolithic integration of PDs in one or two-dimension arrays with electronics, and has great potential to drive cost down for both data center optical interconnect applications and autonomous vehicle/robotic applications using light direction and range (LIDAR) sensors.